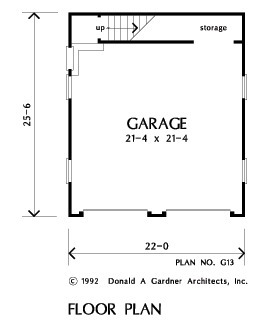 A man-sized door with covered porch add charm to this detached two-car garage plan. The second story provides storage space or can be finished as an office, studio, exercise room - whatever your imagination can conceive. 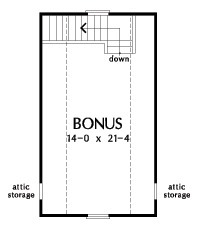 House Dimensions: 22' 0" x 25' 6"
Bonus Room (Vaulted): 14' 0" x 21' 4" x 8' 0"
Garage Storage : 13' 0" x 3' 2" x 0' 0"
Garage : 21' 4" x 21' 4" x 0' 0"